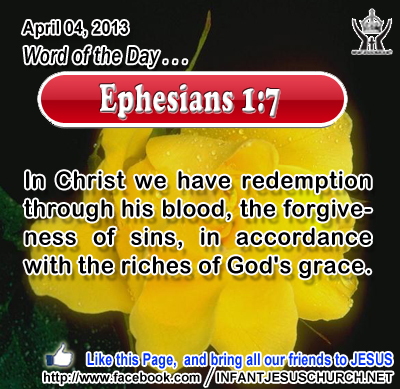 Ephesians 1:7: In Christ we have redemption through his blood, the forgiveness of sins, in accordance with the riches of God's grace. Heavenly Father, for your anguish and cost to forgive our sins by the blood of your Son. We refuse to take lightly the cost of our sin and will live for your glory in appreciation of your grace. In the name of him who sacrificed all for our salvation we pray. Amen. 35Then they told what had happened on the road, and how he was known to them in the breaking of the bread. 36 As they were saying this, Jesus himself stood among them. 37 But they were startled and frightened, and supposed that they saw a spirit. 38 And he said to them, "Why are you troubled, and why do questionings rise in your hearts? 39 See my hands and my feet, that it is I myself; handle me, and see; for a spirit has not flesh and bones as you see that I have." 41 And while they still disbelieved for joy, and wondered, he said to them, "Have you anything here to eat?" 42 They gave him a piece of broiled fish, 43 and he took it and ate before them. 44 Then he said to them, "These are my words which I spoke to you, while I was still with you, that everything written about me in the law of Moses and the prophets and the psalms must be fulfilled." 45 Then he opened their minds to understand the scriptures, 46 and said to them, "Thus it is written, that the Christ should suffer and on the third day rise from the dead, 47 and that repentance and forgiveness of sins should be preached in his name to all nations, beginning from Jerusalem. 48 You are witnesses of these things. Lord Jesus, open our minds to appreciate the scriptures that we may fully comprehend the truth of your word. Anoint us with your power and give us courage to proclaim the gospel in word and deed.